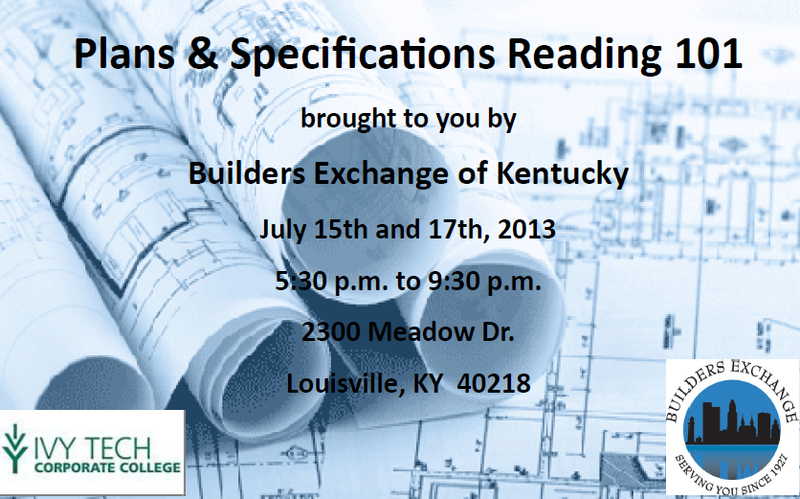 This course introduces participants to reading and interpreting basic construction drawings and specification manuals. Emphasis is placed on the interpretation of the requirements of contract drawings, understanding terminology, symbols, and conventions used in commercial and industrial drawings, including architectural, civil, structural, mechanical, and electrical plans and sections. The presenter for this eight hour course is Lane Stumler. Lane is an adjunct faculty member with Ivy Tech Corporate College and a practicing architect in Kentuckiana. The fee for this program is $295 if registered before July 5th, $325 after the “early bird” date. The course fee includes participant materials, light dinner and beverages for both evenings. Reserve your spot today by contacting Mary Ellen Higgins at 502-459-9800 or via email at mhiggins@bxkentucky.com.